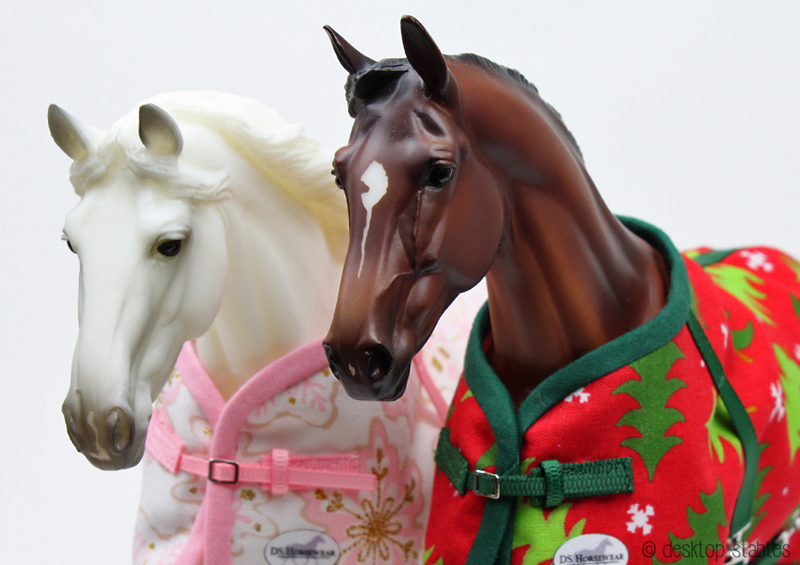 BreyerWest is next week! Slowly, but surely, I’ve been working on getting things done and making sure I have everything. 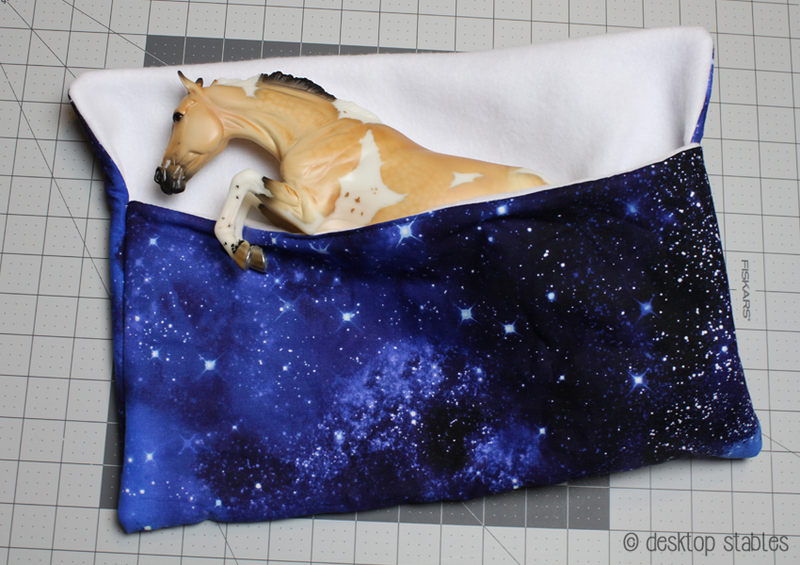 I’ve decided that I need to make new pony pouches for the small group of horses I’m bringing. I made a bunch before my last show but they’re kind of falling apart so NEW ONES IT IS! 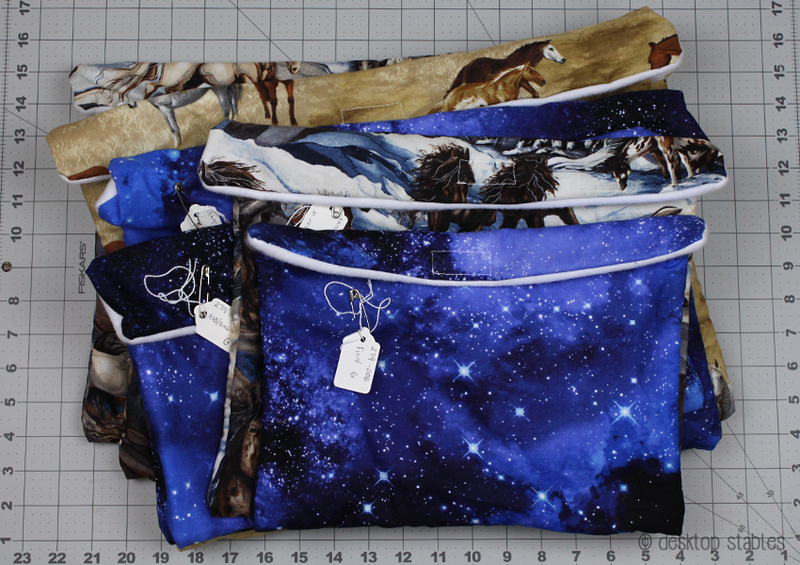 It’s a long term goal of mine to make pouches for ALL the horses anyway, (mostly to make moving them easier) but like many of my projects it hasn’t gotten anywhere. 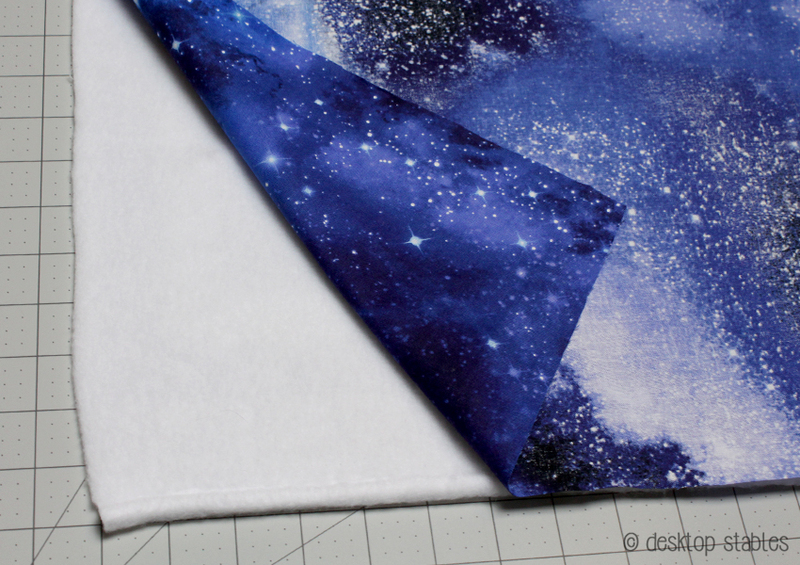 At least now I’m getting a start on it, and putting fabric I’ve had for years to use! 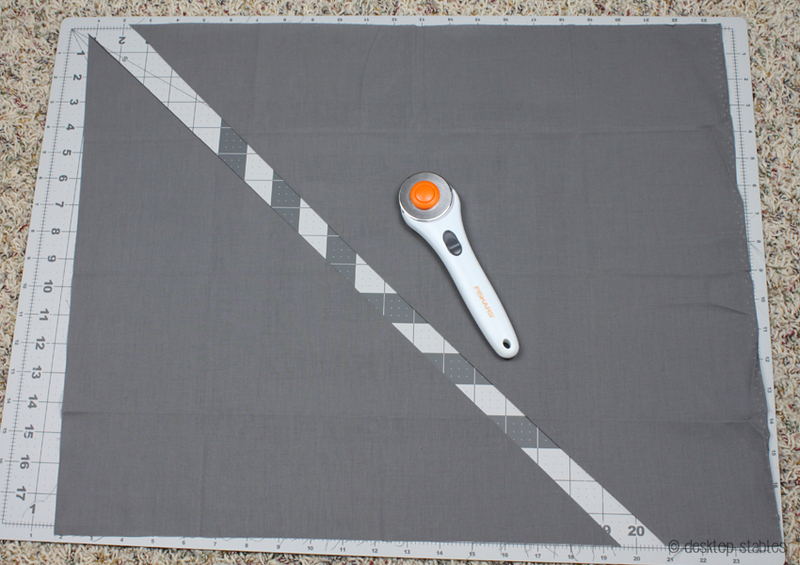 I’m not using a pattern or measurements, but cutting everything by eye. I’m also keeping these very basic. They just need to protect my models, not be perfect! 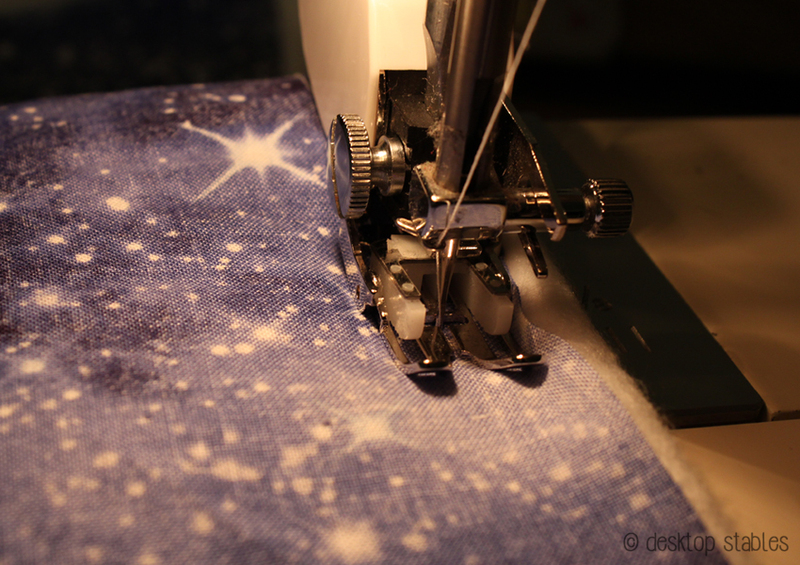 I start by cutting a piece of quilting cotton and a matching piece of white fleece. This one is being made to fit my Bristol, so I’m using him to get an idea of size. 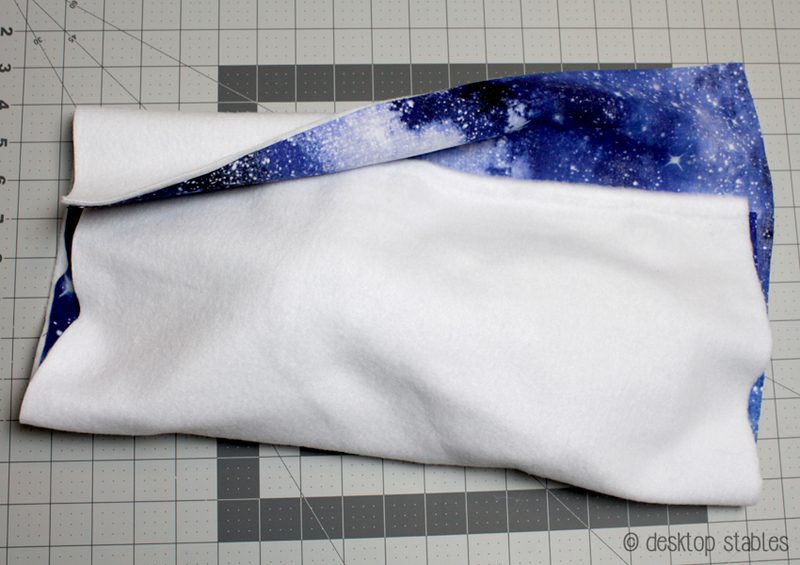 I want the bottom edge to completely cover him when folded up, with extra at the top for a flap. 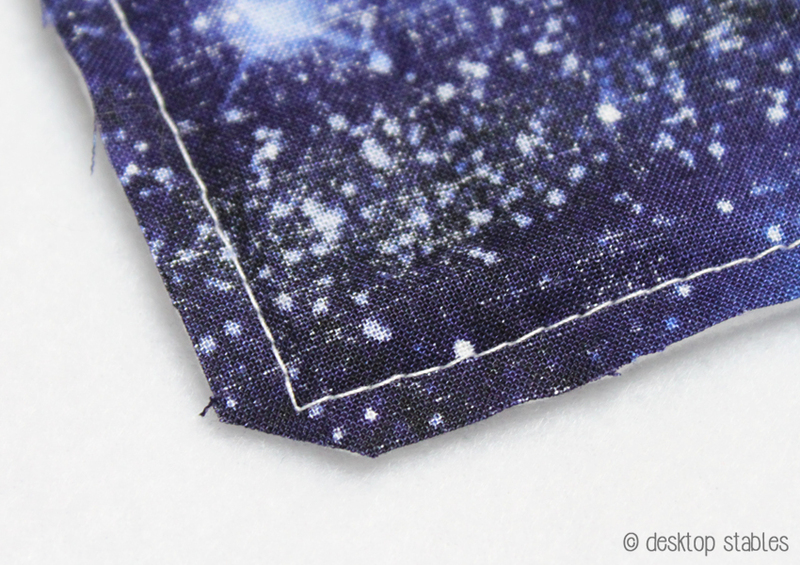 I’m also adding a little extra material for a seam allowance. It’s always better to have too much than not enough! Later I discovered that a standard pillow case is the perfect size for a Traditional pouch. 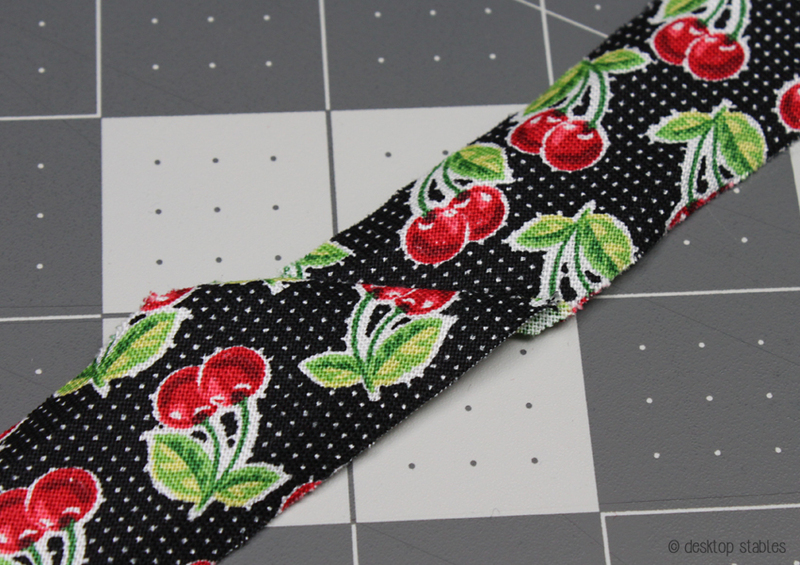 With some models it would have to be wider/narrower/etc, but it’s a good place to start if you need a pattern. 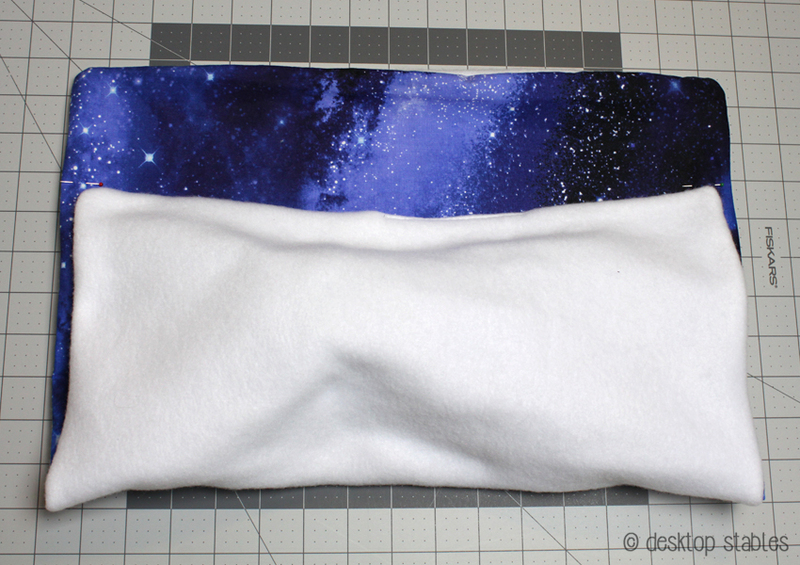 With the good sides of the fabric facing together, I sew along the entire rectangle, leaving an opening at one end. 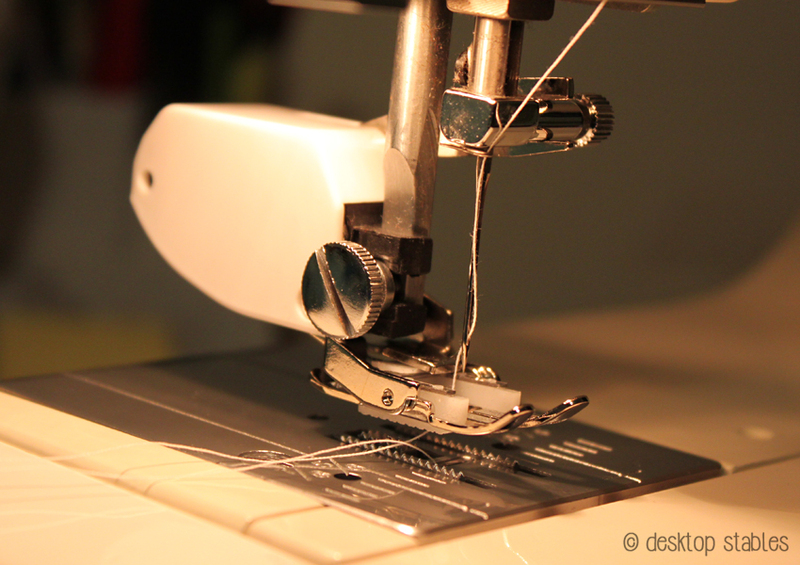 A good habit to get into is to backstitch a couple times every time you start and stop your stitching. 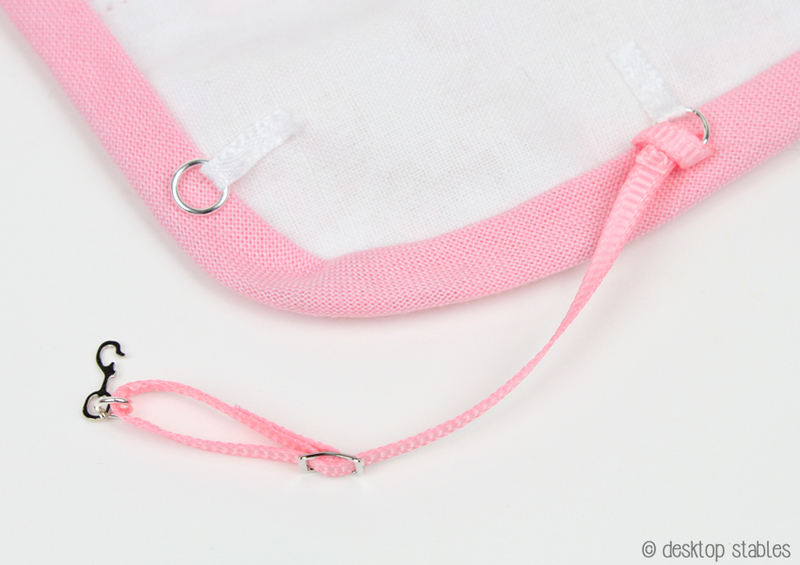 This will lock your threads in place and prevent them from getting pulled out when you turn the pouch right side out. … then turn it right side out. 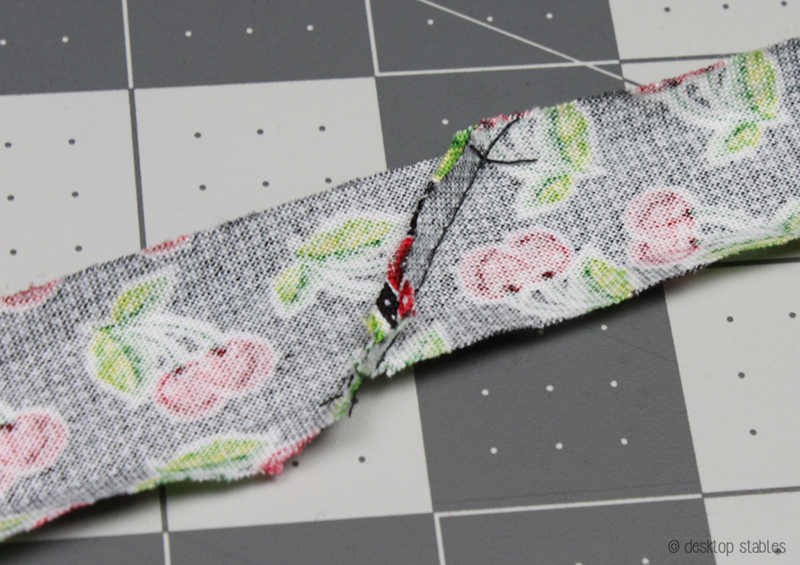 I closed the opening with topstitching, but if you want something neater, you could give an invisible ladder stitch a try. 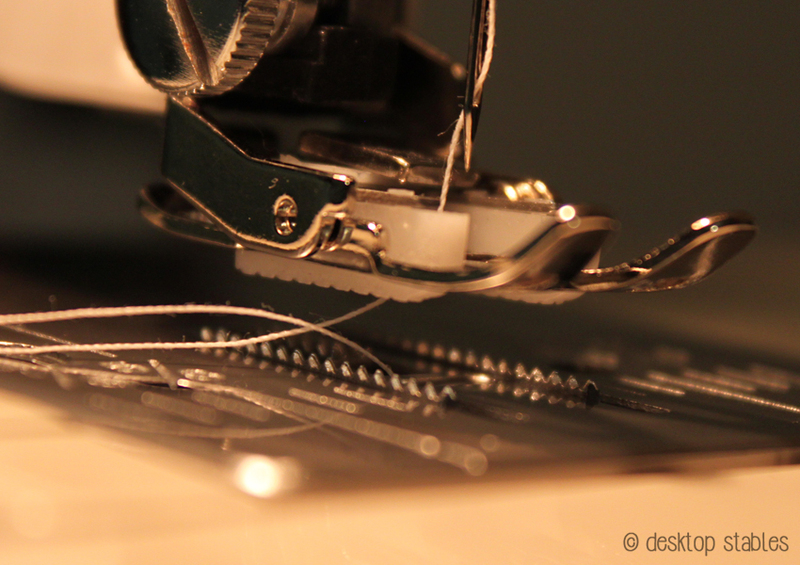 My sewing machine has a really hard time sewing through all four of the layers, so I use a walking foot to help it. This one I purchased off of Sewing Parts Online for around $20, and it’s helped SO much. 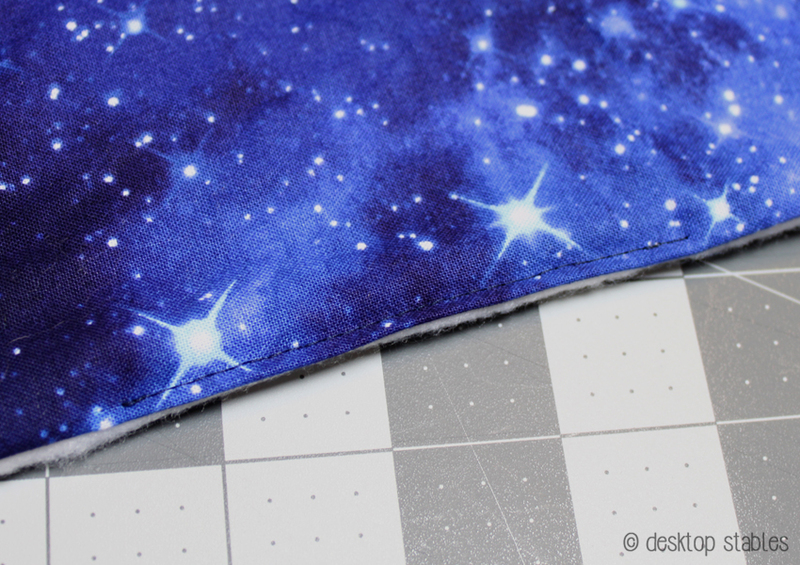 … I turn it right side out again, and it’s finished! I’ve been making a few every day, and have a nice stack already. They’re not perfect, they’re not fancy, but they’re loads better than my old ones. Is it next week yet?!? 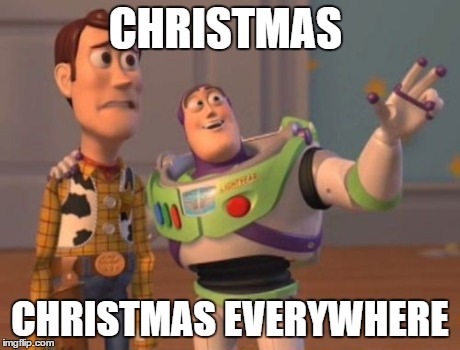 It’s November, so you know what that means! Somewhere between these two I realized that all this time, I have been attaching my leg straps wrong. 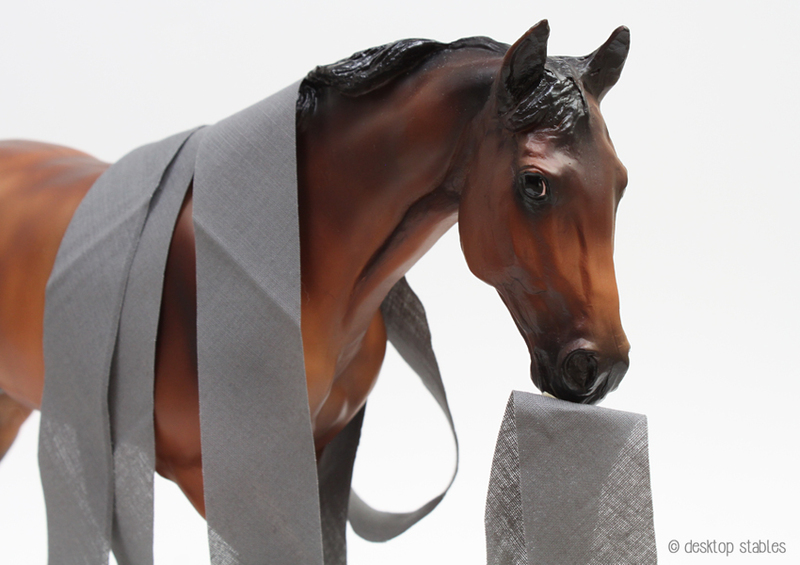 Well, I don’t know if it’s actually wrong, but it is strange, and not something I’m seeing on real horse blankets now that I’m aware of it. To overlook it for this long makes me feel pretty stupid. Have I mentioned I’ve never blanketed a real horse? Well, uh, yeah, now you know. BUT I also see this as an opportunity to learn and make improvements in my work. 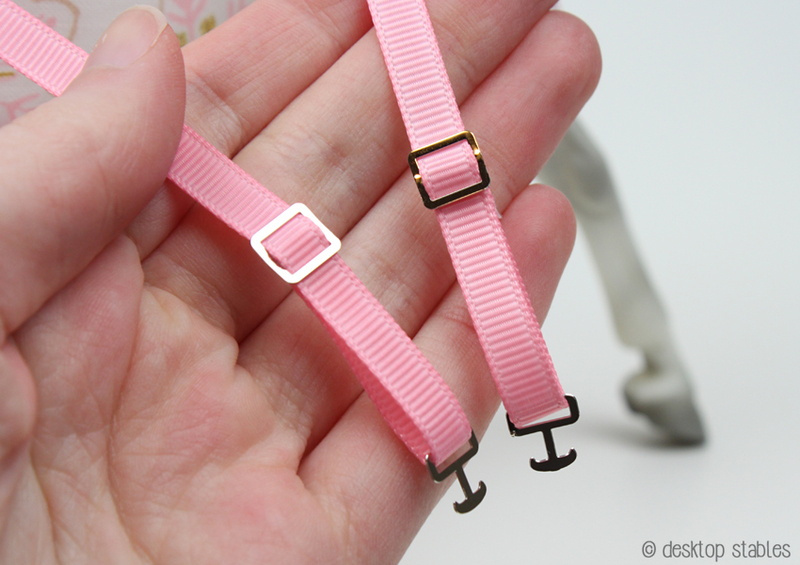 So on the pink one, I lowered them to leg-strap level instead of tail-strap level. Another change was making the straps out of one adjustable loop, which eliminates the free end and makes adjusting a lot easier. This is also something I see on real blankets but never applied to my own work. I also did this with the belly straps, and I wonder why I didn’t do it sooner? It gives a much neater appearance without the free end. 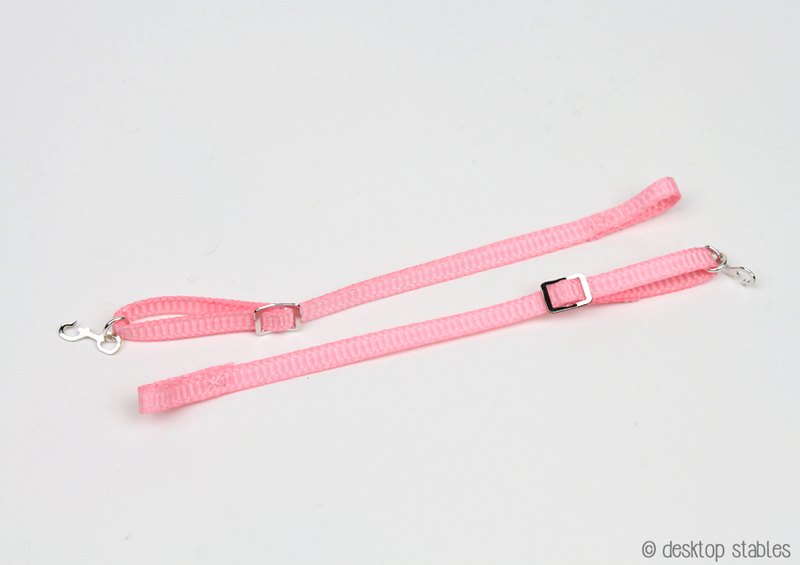 The new leg straps have a loop one one end and a hook on the other. You loop the strap around one of the rings to attach it. I liked this design because it avoids more hardware and secures the strap in a non-permanent way. It’s based off real straps, so it’s both more realistic and less likely to get lost when off the model. 👍 And if they don’t fit the horse at all because of weird leg positions off they go! Doing a little more research on this made me realize that I’ve been crossing them wrong too. (but that seems like a debatable subject in the real horse world…) So here they are, properly looped around each other instead of crossed in an X like I’ve been doing for years. 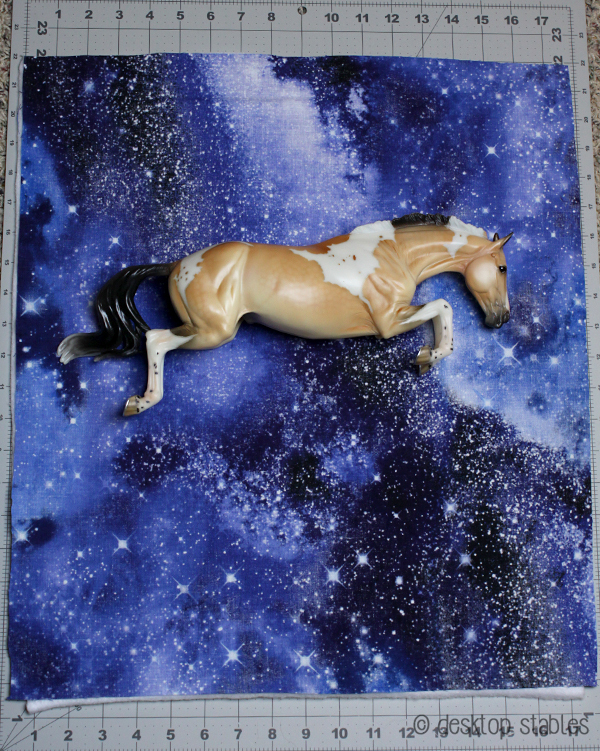 Even though a lot of my blankets (especially lately) are more novelty/fun styled, it’s still important to me to design them in a way that’s realistic, durable and safe, even though they’re for plastic models. Since they’re not exactly show-able pieces like saddles/bridles/etc, I’m not sure how much that matters to anyone else. Let me know your thoughts! While it’s convenient to purchase, pre-made bias has it’s downsides. It can be expensive, especially if you’re using a lot of it. You are also limited when it comes to colors. I am a bit obsessive about things matching, and store bought bias simply doesn’t come in the same exact colors as my fabrics. Patterned bias exists, but again, you’re limited to what’s available. So I learned how to make bias tape myself. There are dozens of better tutorials online explaining how to do this but since I make my bias specifically for model horse tack, I thought I would share my process with you. 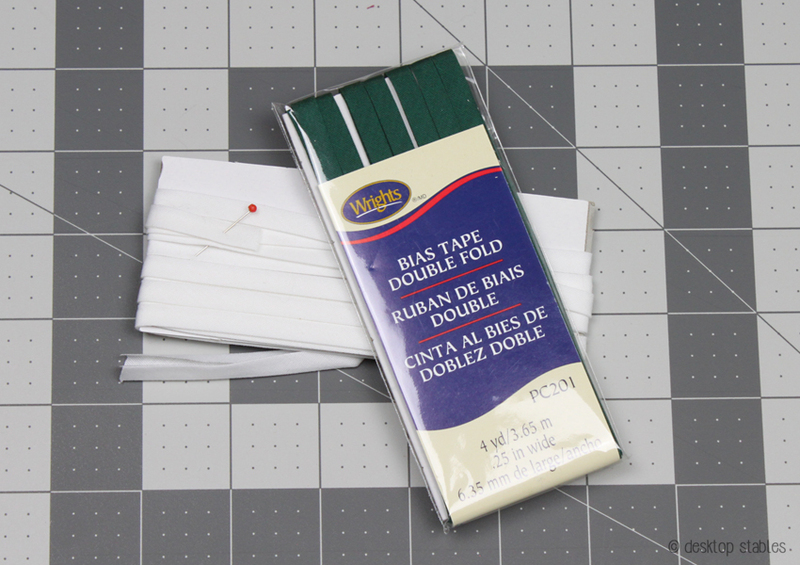 Bias tape maker – these come in different widths and styles. I’ve used this one the most. You’ll also need an iron and ironing board. 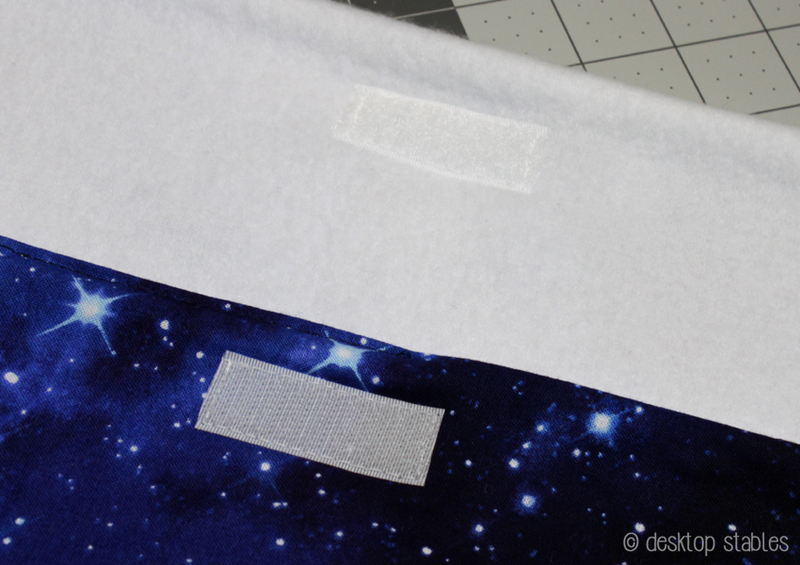 To put it simply, bias tape is made by cutting a diagonal strip from your fabric. 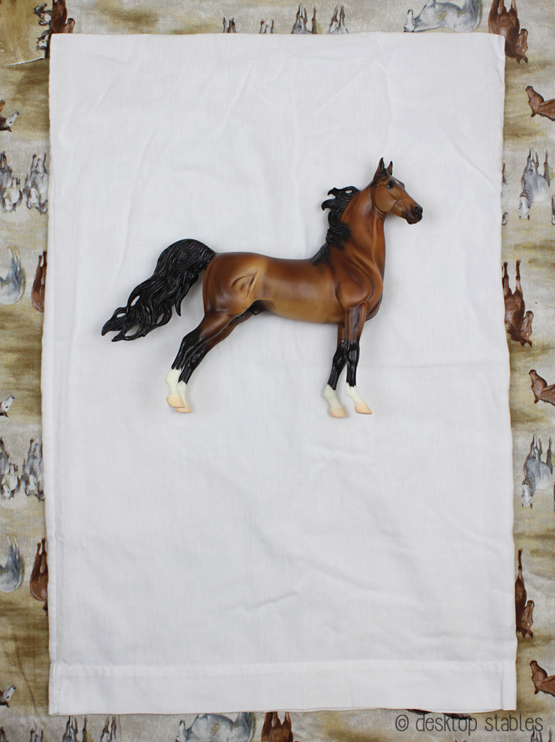 Here’s a square piece of fabric to illustrate. 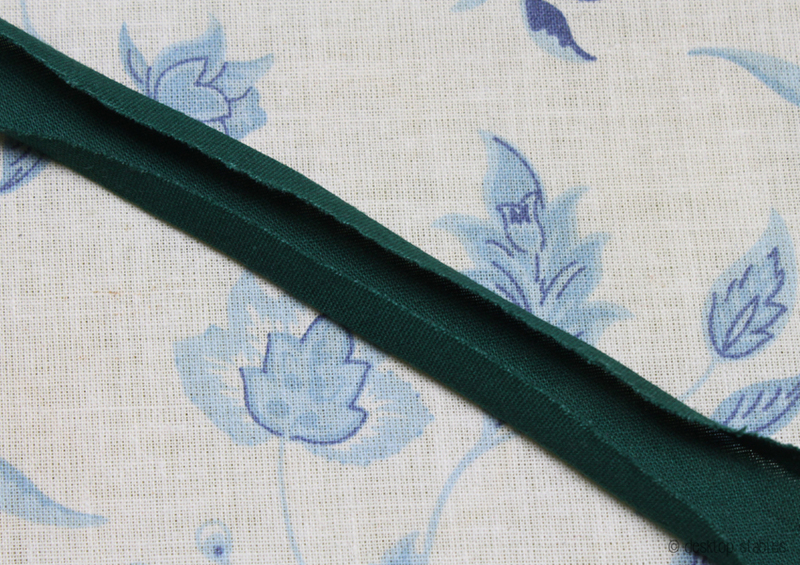 If you tug on both corners of your fabric, you’re going to feel it stretch better than if you tug on the top and bottom. This is where you’ll cut your strips from. 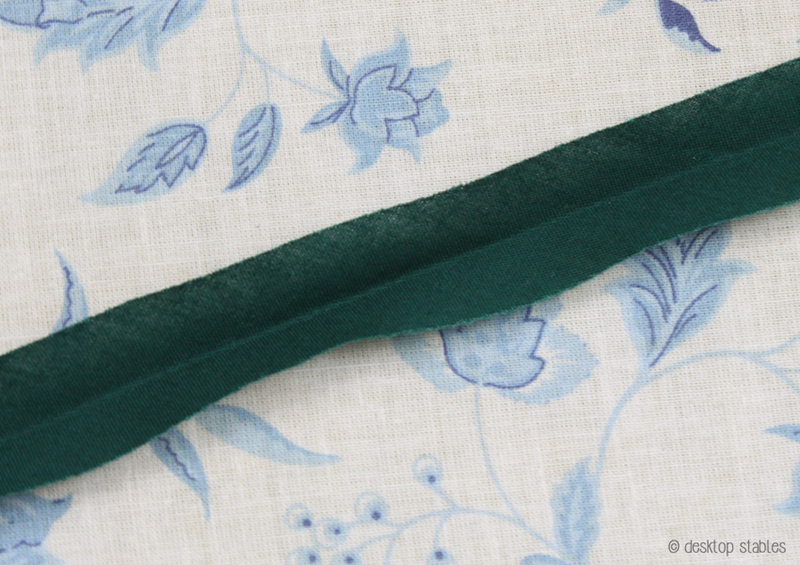 The stretch helps the fabric go around curved edges easier. 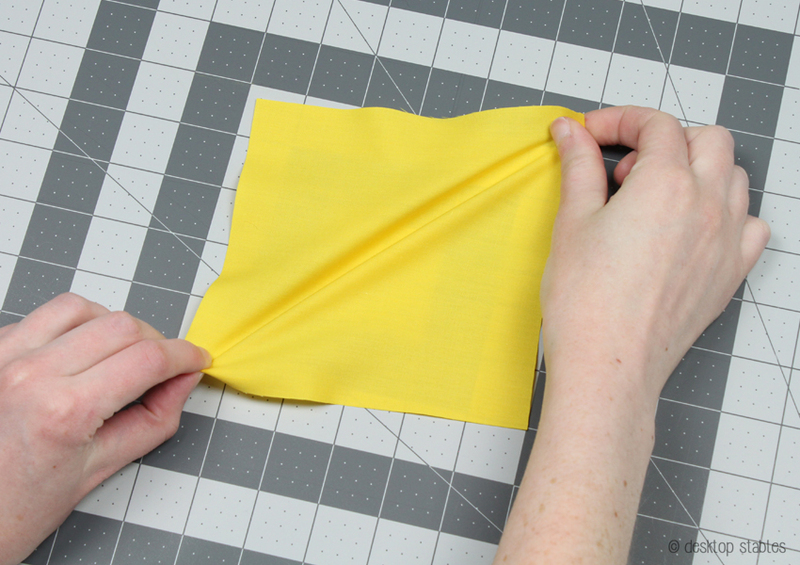 Start by taking one corner of your fabric, then fold it diagonally to meet the other side. You want a 45° angle here. 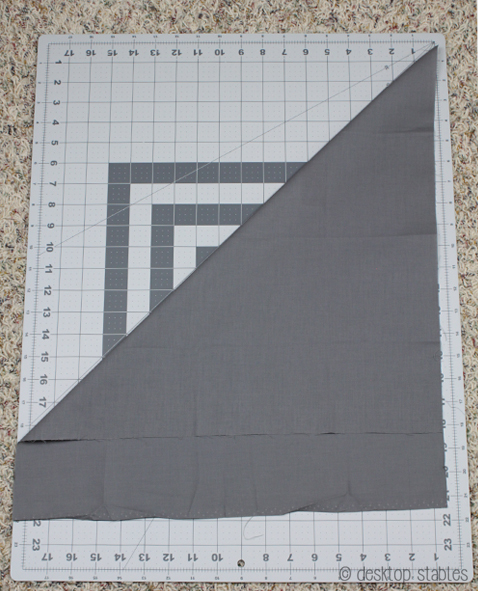 Unless your fabric is a perfect square, it’s not going to fold in half exactly. Iron this fold down, then open up the piece again. 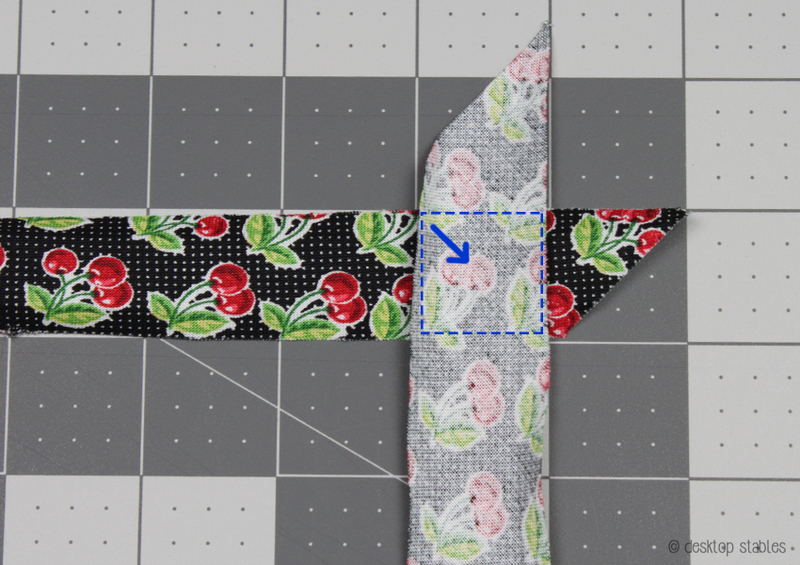 Cut along the fold line – you’ll have two fabric triangles to work with now. 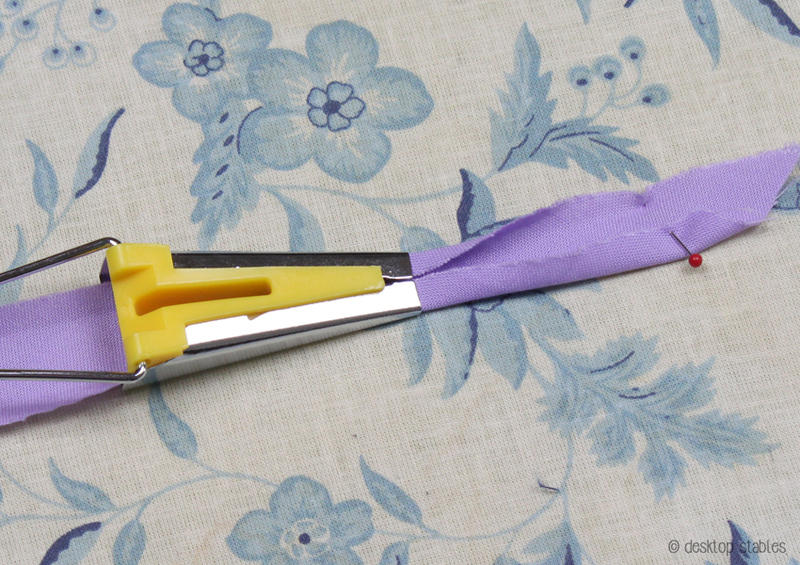 I tend to use whichever is larger first, as I can get a longer piece of tape from it. 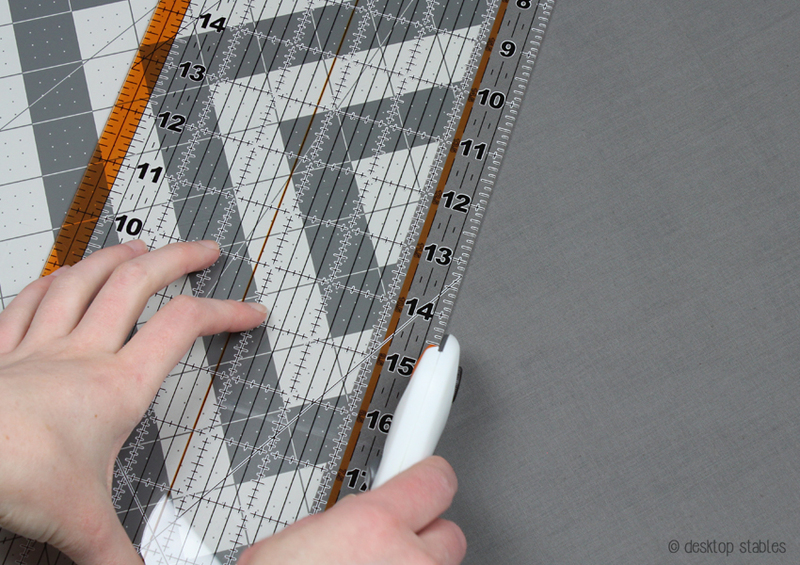 Next, I’ll measure 1 inch from the edge and slice off a strip. 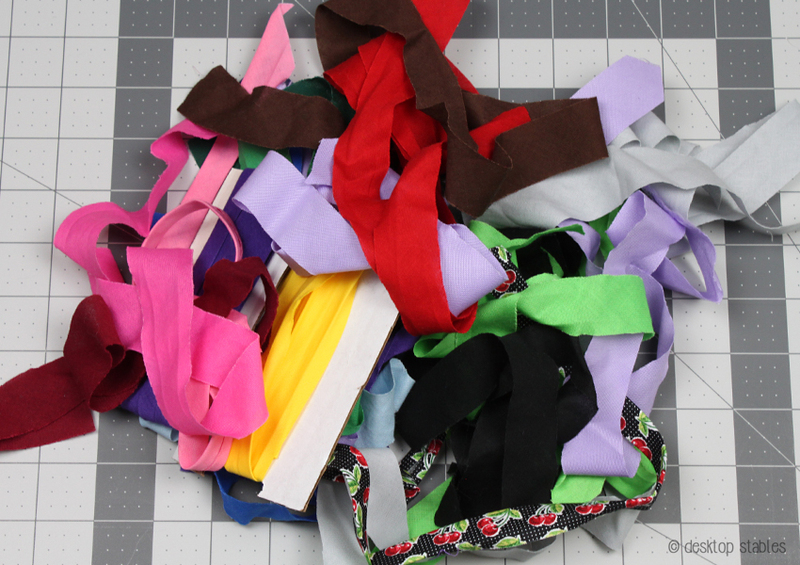 These strips are ready for sewing! I always cut more than what I need. 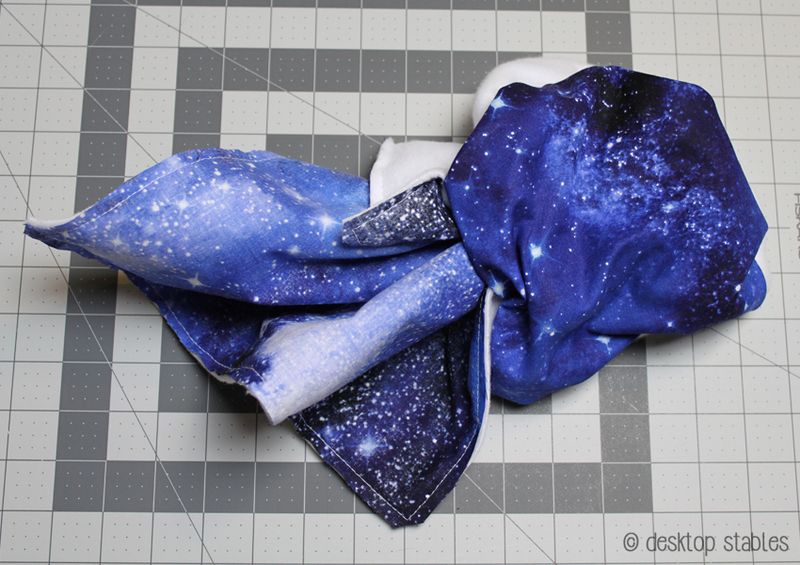 My method for sewing on bias has changed, so I no longer fold it. I was using double fold bias for nearly everything for a few years, and that was made with a metal bias tape maker. 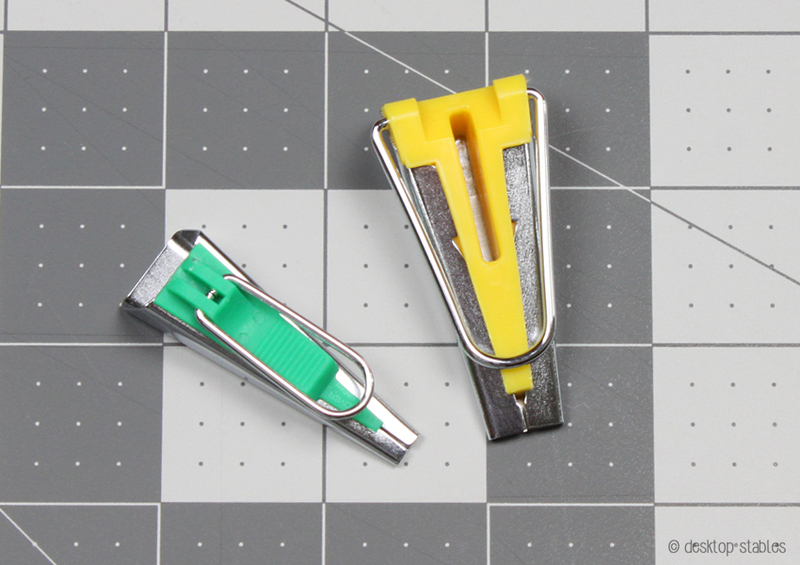 These come in different widths and are super handy for quickly making folded bias. 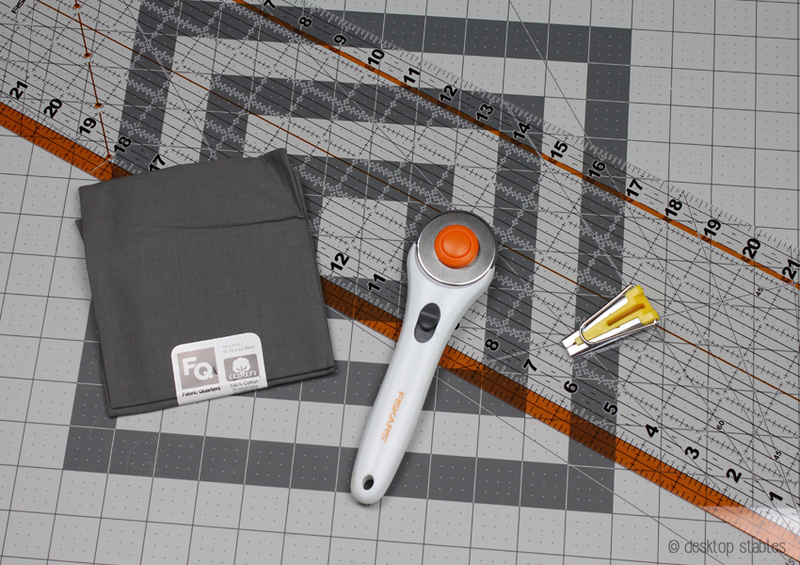 I get the 1 inch measurement from using this tool as it was required for the double fold. (each size is different- they do come with instructions!) To make the tape, feed one end through and anchor it down. 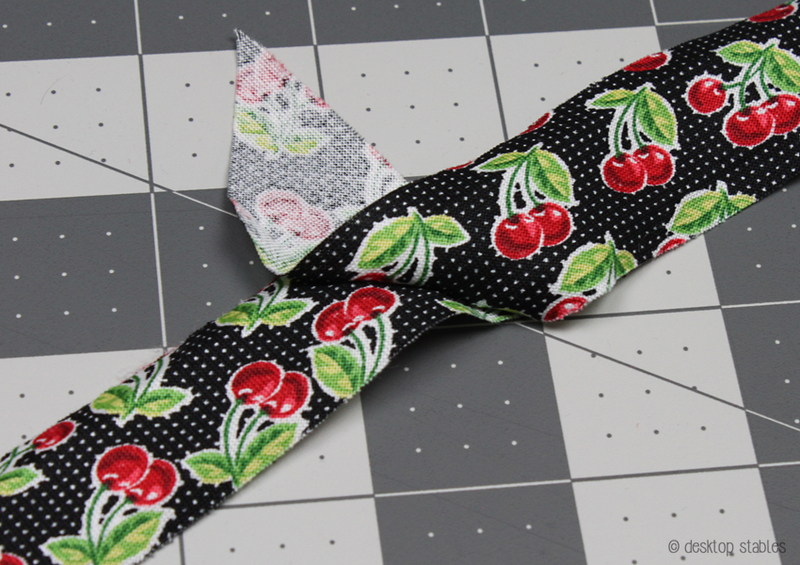 (I pin it to the ironing board) Slide the tool along the strip, ironing down the fold as you go. 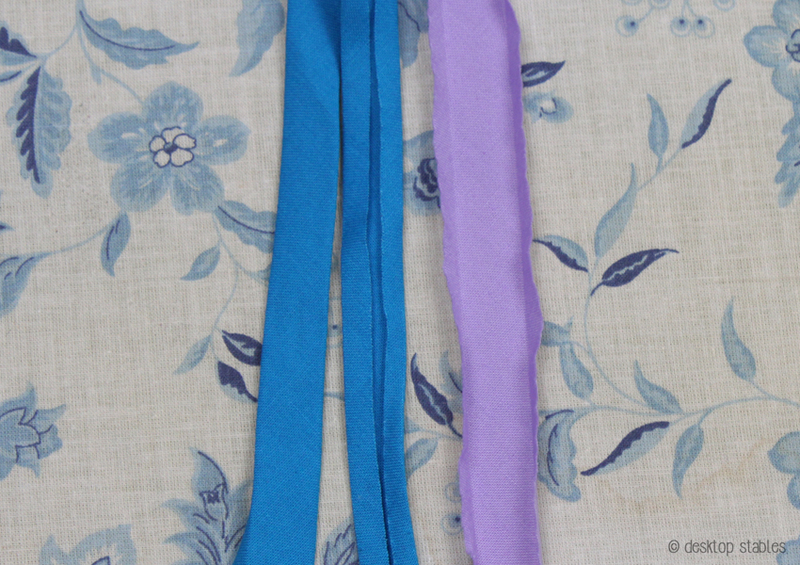 Fabric can (and will) behave differently sometimes – these two strips were made the same exact way but the blue pressed much more nicely. They can both be used this way though, so it’s not a problem. 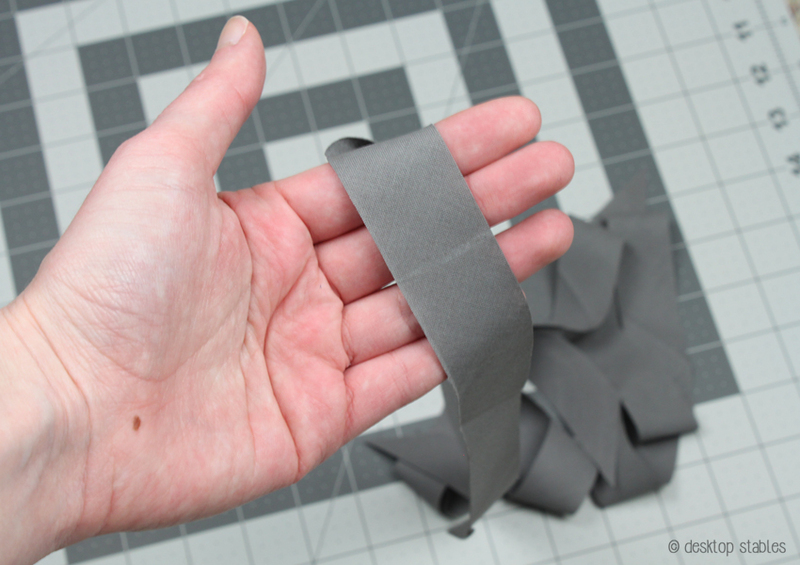 If you don’t have a tape maker, you can still create the fold by hand. First, fold the entire piece in half and iron it down. 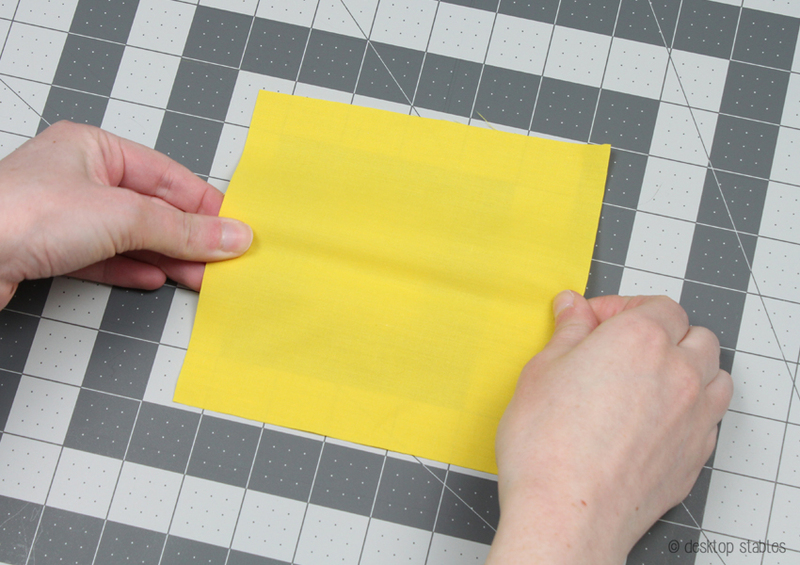 Open this up, then fold in one edge to the center line and iron it down. Repeat for the other side. So, now that your tape is cut, what do you do if it’s not long enough for your project?? I always try to use one piece of tape for the project I’m working on, but sometimes it’s necessary to join two pieces together. This can be a little confusing at first. See the square? 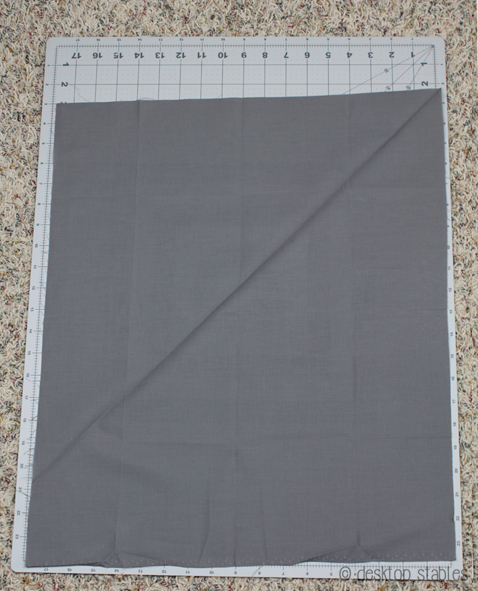 You’re going to sew diagonally across this, from the top left corner to the bottom right. 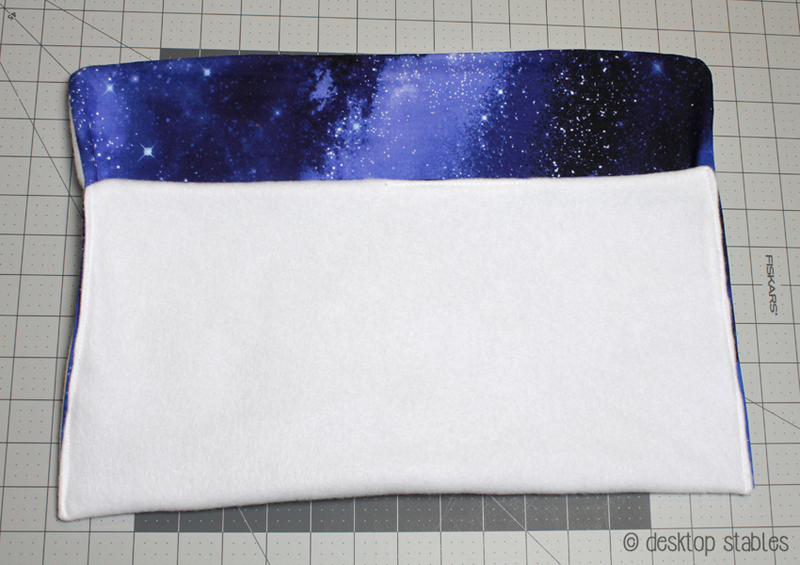 After sewing, cut off the excess, and press flat. Now your tape’s ready to be sewn on!